What do you need to feel at home while on tour? I feel best if my husband and our two wonderful children can be with me on tour, I like a quiet hotel room, a nearby coffee shop, nice local restaurants, or a good supermarket and the possibility of cooking. What is the best thing about being a musician? That you get to play all this wonderful music and meet so many interesting and inspiring people through your work, and that you get to travel and see the world when playing concerts with MCO. What would you do if you weren’t a musician? I would probably still want to work in the musical business, or be a doctor or work with kids. What CDs would you want with you on a desert island? The biggest hits of Dean Martin, Frank Sinatra and Tom Jones; Väsen: Väsen Street; Dietrich Fischer-Dieskau & Gerald Moore: Schubert Goethe-Lieder; Czech Philharmonic Orchestra & Vaclav Talich: Suk ‘Asrael’ Symphony; Cecilia Bartoli: Mozart Arias; Berliner Philharmoniker & Claudio Abbado: Beethoven Symphonies, Leif Ove Andsnes and the Mahler Chamber Orchestra: ‘The Beethoven Journey’. What is the most difficult aspect of your job? That you can never stop playing for a few days or go on a holiday without falling out of shape with your instrument (unless you take it with you). Another difficult aspect is also the very thing that makes music so beautiful, which is that music only exists in the very moment – this adds a lot of pressure to the playing. Julia-Maria Kretz was born in Berlin in 1980. She studied with Prof. Thomas Brandis in Berlin and Lübeck and with Josef Suk in Prague. Along with her piano trio (Julius Stern Trio), founded in 1996, she studied with Menahem Pressler (Beaux Arts Trio) and Georg Sava and Wolfgang Boettcher, and graduated in the class of Niklas Schmidt (Trio Fontenay) at the Musikhochschule Hamburg. Her piano trio has won prizes in various competitions, such as the International Chamber Music Contest Premio Vittorio Gui in Florence (2004), Felix Mendelssohn-Bartholdy Competition in Berlin (2005) and the International Chamber Music Contest Trio di Trieste (2005). Julia-Maria Kretz received a scholarship from the German National Academic Foundation and the PE-Förderkreis für Studierende der Musik e.V. She is a member of the chamber music ensemble Spectrum Concerts Berlin, which also includes musicians such as Hartmut Rohde, Torleif Thedeen and Jens Peter Maintz, and has its own concert series in the Kammermusiksaal of the Berliner Philharmonie. Julia-Maria Kretz has played chamber music concerts with artists such as Janine Jansen, Julian Rachlin, Isabelle Faust, Martin Fröst, Itamar Golan, Mischa Maisky among others, and she has played at festivals such as Julian Rachlin and Friends, the Schleswig-Holstein Musik Festival and Salzburger Festspiele. She has participated in CD recordings with chamber music for NAXOS and Harmonia Mundi. As a soloist, Julia-Maria Kretz has performed with, among others, the Nürnberger Symphoniker, Thessaloniki State Symphony Orchestra and the Berliner Symphoniker at venues such as the Musikhalle Hamburg, Philharmonie and Konzerthaus Berlin, Mozarteum Salzburg, and Herkulessaal München. 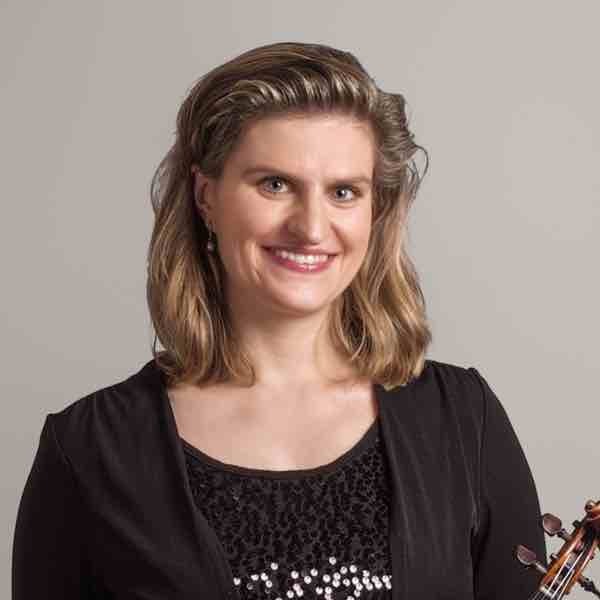 In 2006, Julia-Maria Kretz became a member of the Lucerne Festival Orchestra, and since 2008 she has been a member of the Mahler Chamber Orchestra, where she has led the second violins since 2014. During 2008-2011 she was the leader of second violins in the Royal Stockholm Philharmonic Orchestra and in 2014 she was appointed assistant first concertmaster in the Swedish Radio Symphony Orchestra.